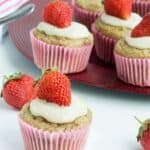 Strawberry vanilla cupcakes – these delicious grain free cupcakes are made using ground almonds with a healthy cream cashew icing. 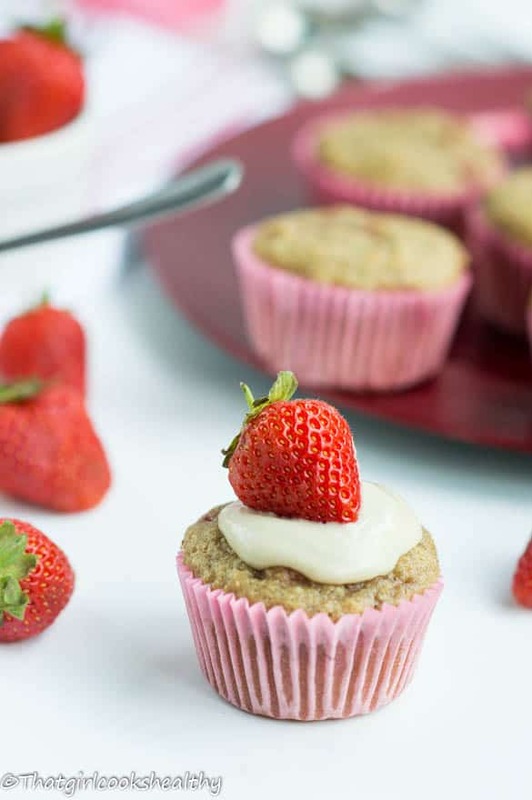 I couldn’t help myself with this recipe guys, I’m sorry if you’re not a fan of cupcakes, not actually on second thoughts I want you to love these strawberry vanilla cupcakes. Another interesting fact about me – I simply adore cupcakes, really I do. Sometimes when I’m out and about I cannot help staring in the window of bakery stores in sheer admiration of these scrumptious looking treats. It might be due in part to being a food blogger, who knows? One thing for sure I’m always on the hunt for copy cat recipes or simply channeling my own creative mind with making a replica of a classic dish. This recipe feels like the big sister to the apple and cinnamon one that I recently made. Although the muffins well received, namely outside of my website I couldn’t help noting a few comments from vegans who were quite keen to make an egg free adaption. Now I have to be quite candid and admit I’m no expert on vegan baking. On that note I’m sure you’ve already guessed these little treats are not vegan friendly, however, many vegans are creating their own egg substitutes in order to replicate the body/structure which eggs provide. Flax eggs are amongst a popular choice, one flax eggs constitutes one egg, I’m still working with flax egg at the moment to get my vegan game on. My recipes are gluten and dairy free not vegan BUT…..as I’m a woman who strives to be knowledgeable in all areas vegan baking is definitely an avenue I’m hoping to explore more in the future. One vegan cakes that comes to mind my my vegan chocolate orange cake. For now I’m focused on this recipe at hand, it’s a light, airy summer time treat. The pastel colours compliment the current season – warmth with plenty of sunshine. 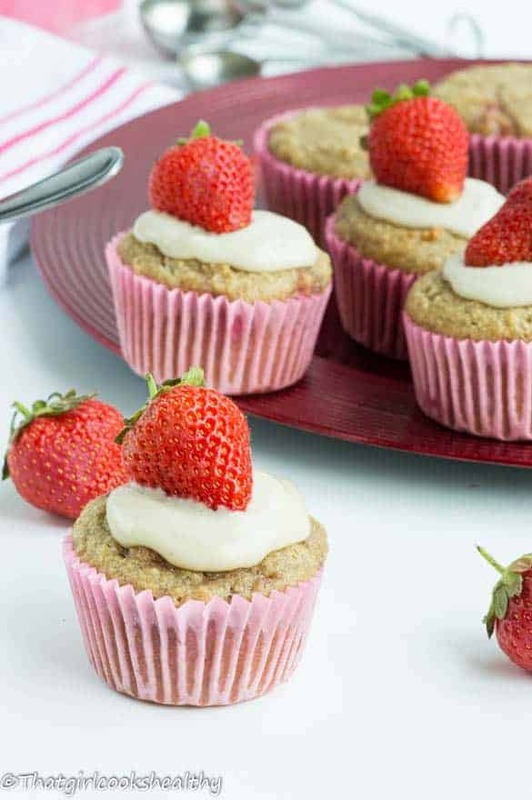 Just envision yourself in the back yard sipping on pimms with a strawberry cup cake in the other hand. 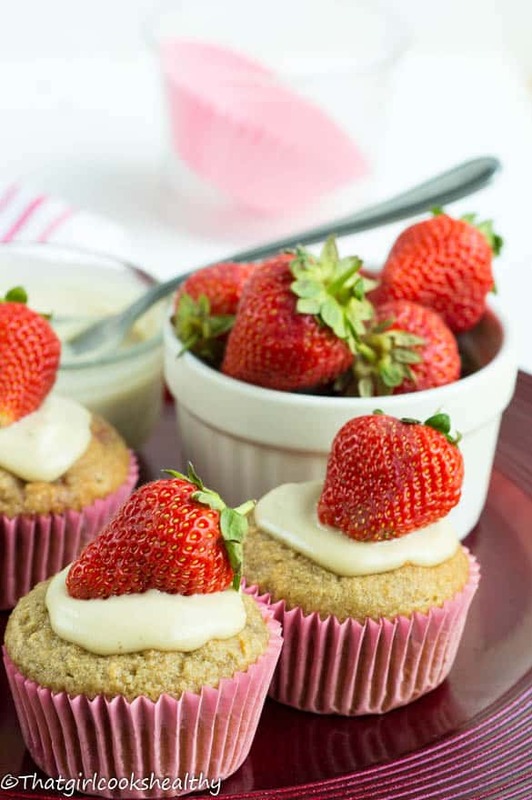 The icing for the strawberry vanilla cupcakes is made from pureed cashew nuts making it a healthy topping rather the sugar loaded frosting you’ll find on conventional cupcakes. The texture is slightly thin but certainly not runny, I achieved this by soaking the cashews for several hours, pureed them to the desired texture. If you’re after a thickish texture, go right ahead, though, would that fall into the category of a frosting as opposed a icing/glaze. The additional water is what dermines the overall texture you seek. 1 cup of cashews, soaked for 3-4 hours in lukewarm water. Preheat oven at 180 degrees celsius or gas mark 4. Line a muffin tin with some cases and set aside. Proceed to add all of the dry ingredients into a large bowl and mix together. Crack and beat the eggs with a whisk in a separate bowl then combine with melted coconut oil. Gently stir the eggs into the flour mixture until completely mixed together and creamy. Now fold in the chopped strawberries then finally stir. Scoop the muffin batter into muffin cakes, use a spoon or ice cream scoop to do so and fill the case almost over ¾ to the top. Transfer to the oven and bake for 20 minutes or until slightly golden, check their readiness by inserting a tooth pick or skewer, it should come out clean if not bake for a further a few minutes and re-insert the skewer. Once done, remove from oven and set aside for 5 minutes before putting them on a cooling rack. Allow to cool before applying the icing, to make the cashew nut icing simply puree the ingredients in the blender – at the water a tablespoon at a time until the desired consistency is met. 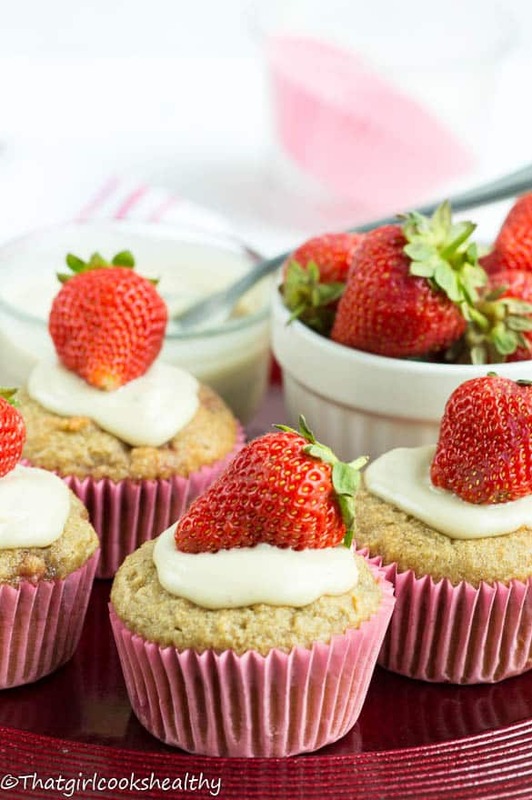 Decorate the cupcakes with strawberries. 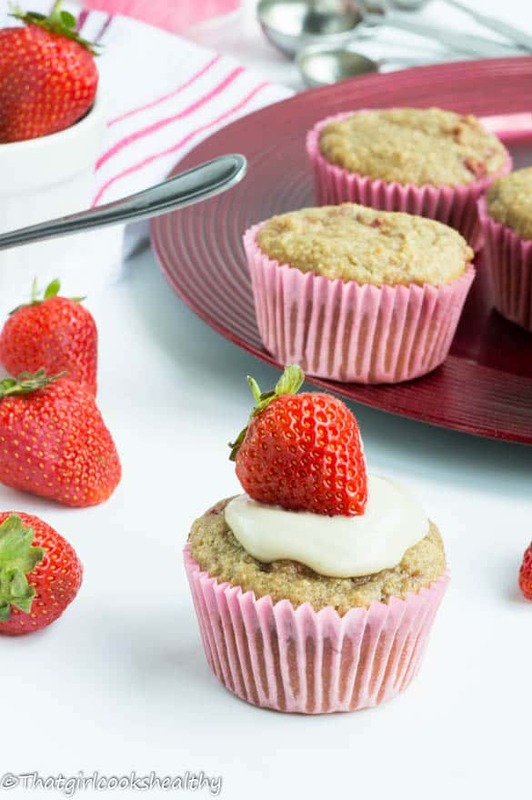 Store the cool muffins in an airtight container for 2-3 days or in the freezer. this look so cute and yummy! putting them on my recipe list! Awww thank you SO much for your comment.